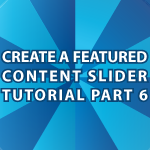 In this part of my tutorial on how to create a WordPress Featured Content Slider I’ll cover many topics. Pull Post Titles, Excerpts, Links, etc. All of the code used in this tutorial follows the video. Use it however you’d like. I also show you how to use Tim Thumb below and provide the script. To turn an image into a thumbnail you can execute timthumb by passing it the image to shrink, height, weight and give a variable named zc the value of 1 like this. I talk about Tim Thumb further in the video above.